Some people think that a crumble is a bit boring or old-fashioned, preferring to top their fruit with a pastry layer, but for me the crumble comes ou on top with its buttery, crispy top layer acting as a blanket for the hot, tart, fruit beneath. It’s also so adaptable; you can use any combination of fruit and you can pep up the crumble with oats, cinnamon, almonds, chopped hazelnuts, or a handful of seeds so you get almost a different dish every time. My favourite recipes are the simple ones, basic crumble made with Bramley apples and whatever fruit has been lovingly stored in my freezer from the summer, all ready to be whipped out on a cold winter night to give a little reminder of warmer times (I have black currants and red currants, stored but I’m sad to say I’ve eaten the blackberries already, no patience I’m afraid!). The other one I use is my mum’s creation. 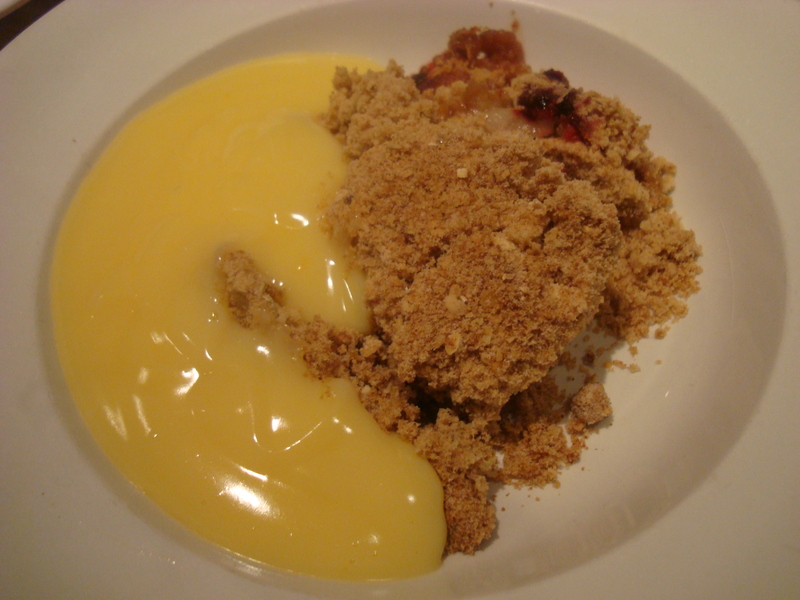 A basic crumble, but she used to call it ‘spiced peach struesel’ which gave it an air of the exotic and decadent. It is really just tinned fruit with cream and crumble, all in one dish. Its best made when all the fruit has disappeared from the trees and the freezer, perhaps in the depths of January when our own seasonal produce has run dry. It uses nothing more than tinned peaches of all things. Rub butter into flour until it resembles fine breadcrumbs. Stir in rest of ingredients. Layer fruit in a shallow dish and sprinkle the sugar over. 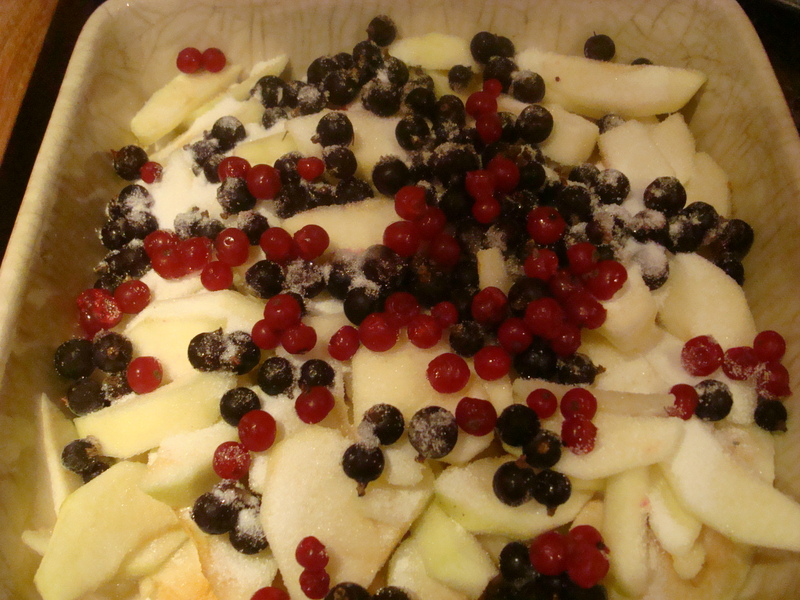 Sprinkle over the crumble so that the fruit is completely covered. Bake in a preheated oven gas mark 4, 180 degrees f, 350 degree c for about 40 to 50 minutes. Make the crumble in the same way as above. Mix together cream and lemon juice and leave for about 15 minutes. Drain juice from peaches saving about 4 tablespoons. Turn fruit into a shallow dish as before with the juice. Pour over the cream and then sprinkle over the crumble mixture. Bake in the oven (same temperature as above) for 40 minutes. You can just serve this as it comes, it doesn’t need anything extra. Eat while warming toes in front of the fire….although i think I say that about everything! !